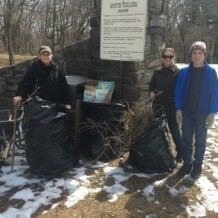 Join us for our Early Spring Cleanup in Glen Providence Park! This is the first of our three main volunteer days we have scheduled this year: the next two are CRC Watersheds Annual Streams Cleanup on April 30, and National Public Lands Day on September 24. We also have regular Invasive Plant Removal days – see our 2016 Schedule of Events for more information! Early spring is a great time to tackle trash that has blown into odd spots, before vegetation grows! Stay tuned for possible updates – if we have snow cover, we may reschedule to a later weekend in March. Meet at the Glen Providence Park main entrance on West State Street in Media at 9:30 am. Bring gloves if you have them. Additional gloves generously provided by CRC Watersheds Association. We recommend long pants and long sleeves to protect against poison ivy, ticks, and thorns. Our rain date is Sunday, March 6. If the weather is not clear, we will post here and on our facebook wall by 8:45 am Saturday advising whether we will use the rain date. And if there is snow cover, we may reschedule to a later weekend in March.